When I was in college, I tried a thought experiment with my friend Chris who was an architecture student. I outlined an idea I termed “freak nomadism”. In a nut shell, it was a way to organize a society with the least organization. People would move around as they wished, forming and reforming into “families” of like-minded folks who want to be together. No one would own a home. Possessions would be minimal. Architecture would need to be reconsidered to accommodate this peripatetic nature since ad hoc families would temporarily occupy whatever available spaces happened to suit them. One could use or take anything needed while in the space, but there was an equal expectation to leave something useful behind. Of course, yes, yes, I know, there are all kinds of problems with this vision – whose gonna produce everything, where will you get your mail, the tragedy of the commons… blah, blah forever. As I recall, Chris hated the idea and wouldn’t even play along. Currently, I’m with four others: Dirtnap, Gizmo, Namaste, and Pac Man. This little group has formed and reformed into this current permutation. We understand its impermanence. It will undoubtedly coalesce into still more configurations. It’s 9pm. We are sitting on our pads on the ground in the forest, spread out all over, telling stories and laughing. Each of us has a food bag with its contents partially dumped out. 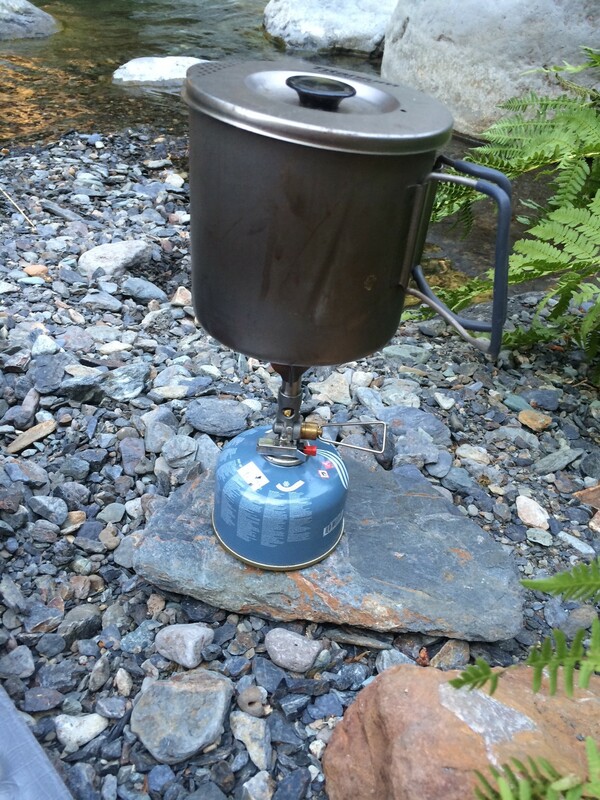 Some of us have little stoves. We’re boiling water and stirring up meals. It’s totally comfortable in this kitchen/ living room we create simply by being here and making a meal. Provisional furniture, devised from logs and rocks, create back rests, “room” dividers, and “coffee” tables. But we don’t move these objects into place. Instead, we seem to always fit ourselves into their composition. We’ve become expert at choosing sites with good camp furniture to fit ourselves around. We spot a millipede and watch its million feet oh-so-gently brush the ground. If you walked 2,650 miles with more feet would they all hurt equally? Would each foot share more of the load? Would this be an improvement over walking on two feet? What about snakes? No feet = no foot pain! I eat some of the food that I found in the hiker box at the Braatens. Another hiker no longer wanted/needed it. 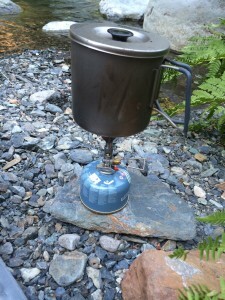 I myself have left socks, food, and fuel at various hiker boxes along the way. Most likely another hiker found them useful too. Namaste switches the song from Norwegian Death Metal to Electronica. It occurs to me that I am living the Freak Nomadism thought experiment. I’ve dispensed with the architecture all together. Comfort is now found in the gathering of people and an attention to conversation rather than the ideal of perfectly arranged Eames chairs and Danish mid-century modern teak sofas. Each night I choose where to live depending on the people I’m hiking with, interesting vistas, most comfortable temperatures, proximity to water, and arrangement of natural objects. Every night, my home is unique, beautiful, and feels like “mine”- one of many. Tomorrow morning we will each gather our things and leave this home, each on our own time. There’s no need to wait for anyone. We’re all walking the same path and will undoubtedly leapfrog each other. And, if not, we will become part of another group, in another plein aire living room thinking about other forest creatures. This entry was posted in Transmissions and tagged California, dirtnap, freak nomadism, gizmo, Hike, living room, namaste, pac man, PCT, trail journal. Bookmark the permalink.